Jagermeister is a herb liqueur brand that was developed in Germany back in 1934, the liqueur started off only been available in Germany but over the years Jagermeister has slowly been launched all over the world and is now one of the most loved liqueurs for music lovers and others all over the world. The liqueur plays an important role within the Jagermeister brand, but they also have a major influence within the music world, if you go to gigs across the world you will most probably come across Jagermeister banners and liqueur, if you go to festivals across the world then you will come across Jagermeister tour busses that sell their liqueur and also give Jagermeister related products away to the fans. It's not just the music fans that Jagermeister help out, they also help bands across the world with sponsorship and they have grown to be one of the most respected company's within the music world and it is easy to see why when you see the strong relationship Jagermeister has with the people they work with. Jagermeister also sponsor us at Alternative Vision and have provided the team members with these fantastic co sponsored Jsagermeister/ Alternative Vision T-shirts. 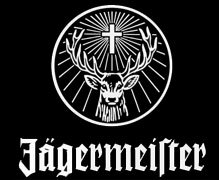 For more information on Jagermeister click on the Jagermeister banner on the right hand side of the site to be taken to their website. * Please not the above is the views of Alternative Vision and has nothing to do with Jagermeister whatsoever, all photos copyright Robert Lawrence.